Subtropical Storm Alberto is looking more organized tonight as it moves into the southeastern Gulf of Mexico. The storm's outer bands are overspreading the Florida peninsula this evening and bringing heavy rain, gusty winds, and the chance for tornadoes to the southern part of the state. 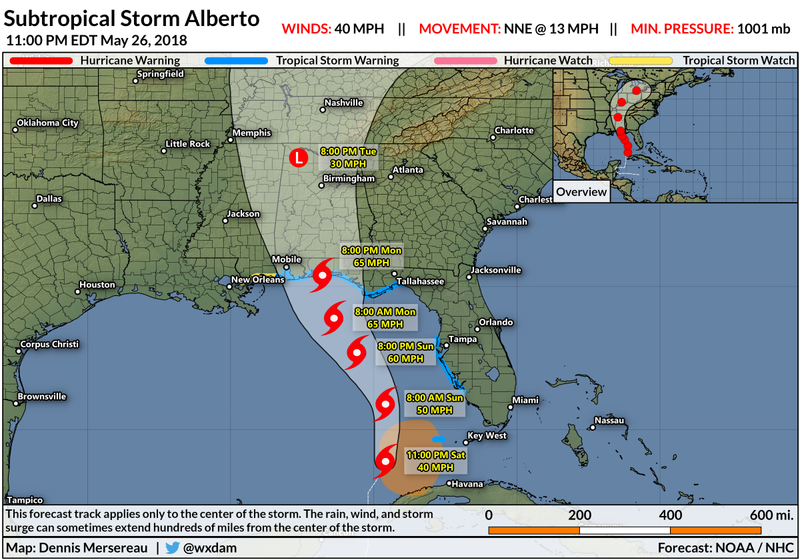 Tropical storm warnings are in effect for coastal parts of Florida and Alabama ahead of Alberto's expected landfall on Monday. The National Hurricane Center still expects Alberto to strengthen into a strong tropical storm before it comes ashore on the Florida panhandle near Pensacola in the afternoon or evening hours on Monday. The latest forecast shows the storm reaching maximum sustained winds of around 65 MPH by landfall. Alberto is still a subtropical storm due to its interaction with upper-level winds; thunderstorms aren't completely driving the storm's development yet. The center has reformed a couple of times over the past day or so as new thunderstorms pop up near the center. This has caused the storm's minimum central pressure to fluctuate every couple of hours. The storm went from 1005 mb on Saturday morning to 999 mb in the afternoon before coming back up to 1001 millibars when the center relocated yet again on Saturday evening. The storm certainly looks healthier tonight than it did last night. Infrared satellite imagery around 11:30 PM EDT shows deep thunderstorm activity near the center of the storm and a big, curved outflow of cirrus clouds stretching east into the Atlantic Ocean. It's getting the "look" you'd expect of a tropical system rather than an amorphous blob of clouds that even experienced weather enthusiasts would have a hard time picking out of a lineup. 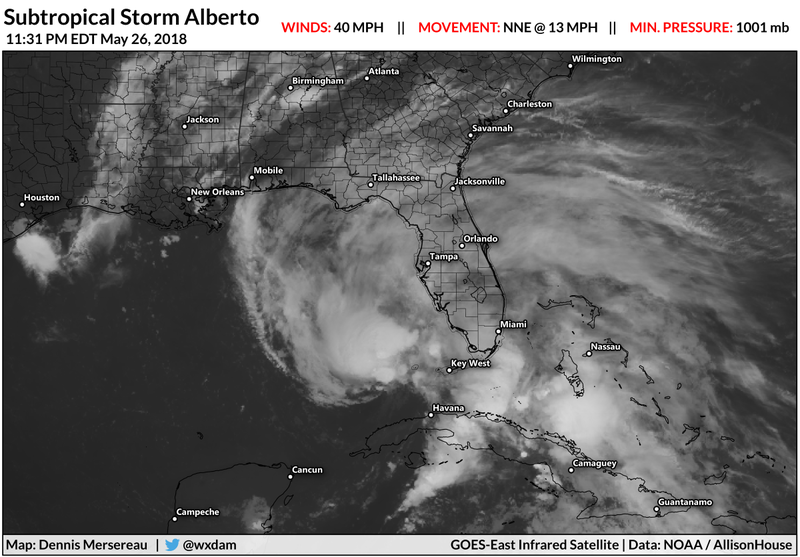 Thunderstorms should root themselves over the center of circulation as the environment becomes more favorable for tropical development, helping Alberto become a fully-tropical storm and allowing it to gradually strengthen through landfall. Alberto is lopsided and it'll likely remain asymmetrical through the rest of its life. This will affect the distribution of heavy rain over the next couple of days. The greatest threat with this storm remains flooding from heavy rain. 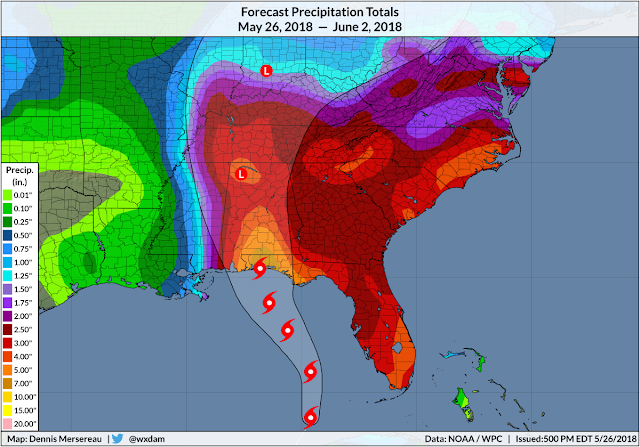 The Weather Prediction Center predicts a widespread area of 2-4" of rain across the southeast with more than 7" possible where the storm makes landfall. I overlaid the storm's predicted track over the rainfall forecast to show the uneven distribution of rain—the cutoff between flooding rains and a nuisance will be just a few dozen miles. While rain is the greatest threat, we can't ignore the potential for wind damage. Downed trees and power lines will likely cause power outages in some spots. There's also the possibility of trees falling on buildings and cars. The greatest risk of bodily harm during Alberto will be due to flooding, rip currents, and falling trees. 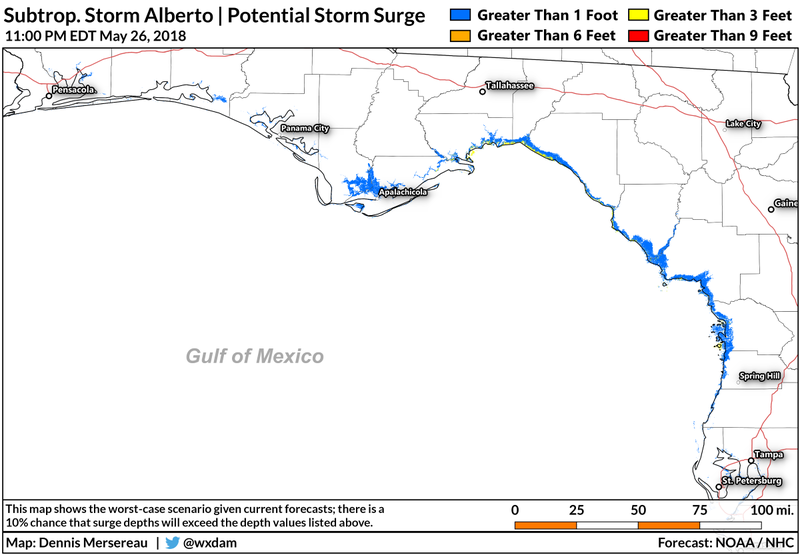 A storm surge is possible as Alberto makes landfall. 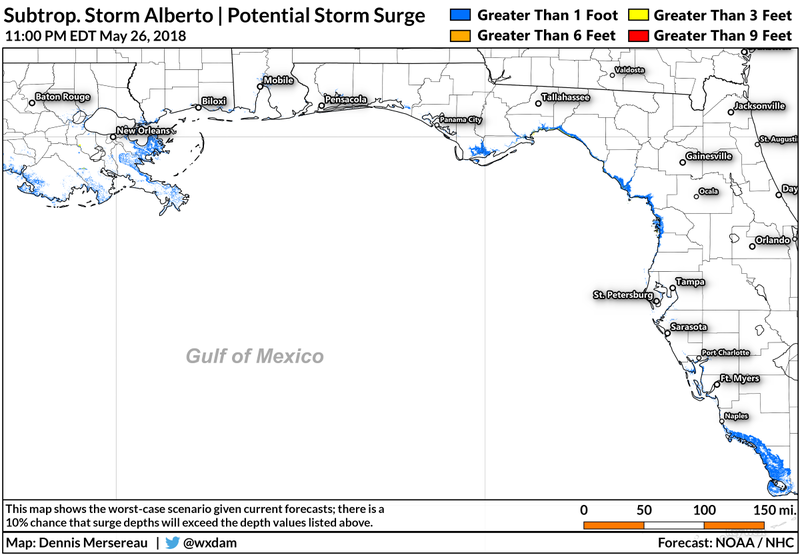 The above map shows the National Hurricane Center's "reasonable worst case scenario" for storm surge along the coast. 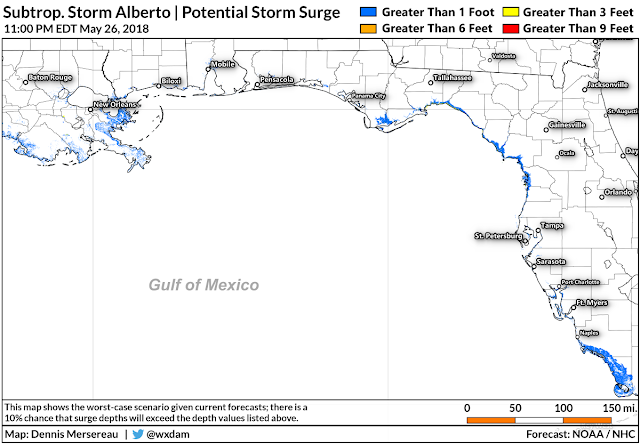 A storm surge of 2-4 feet above ground level is possible along the coast at high tide, especially in the Big Bend region of Florida. Thankfully, this is one of the least-populated stretches of coast in Florida, but people still live there and storm surge flooding is dangerous even if it's a handful of homes at risk. In addition to the rain, wind, and storm surge, tornadoes are a concern across Florida on Sunday and Monday. The tornado threat will stretch into Alabama and Georgia as Alberto comes inland on Monday and Tuesday. Small, quick tornadoes are common in the outer bands of tropical cyclones as they interact with land. These tornadoes can happen so quickly that they afford forecasters little or no time to issue tornado warnings for the affected areas. 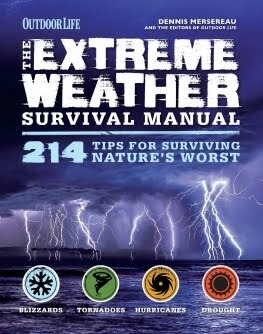 It's extremely important to have a reliable way to receive severe weather warnings as Alberto approaches over the next couple of days. There's been far less rain around Daytona Beach than I was expecting (so far at least). Even got a couple long bike rides in.